M51 was the first spiral structure ever observed by Lord Rosse in 1850 at a time when the true nature of galaxies was unknown. Its undeniable beauty explains its recognition as a true showpiece of the night sky. Probably less appreciated is that M51 represents a dramatic demonstration of an interacting pair of galaxies. As truly immense structures, galaxies are relatively large compared to the average distance between them. Most galaxies are separated by a distance of only 20 times their diameter compared to stars which are separated by 10 million times their diameter. As a result most galaxies are likely to encounter other galaxies at least a few times over their immense lifetimes. The encounters run the gamut from "major" mergers involving the collision of two comparable mass galaxies to more "minor" mergers involving the consumption of a small companion or satellite galaxy by the more dominant galaxy. Astronomers currently believe that galaxy formation is an ongoing hierarchical process. The basic form of a galaxy is established early in its history as the galaxy emerged from its primordial cloud. Billions of years later galaxies continue to evolve even in the present time, through major and minor mergers. Collisions and mergers certainly occurred with greater frequency in the early universe but without question continue into the present epoch as we observe many galaxies in the local universe, such as the M51 complex, showing the strong signatures of ongoing interactions. When encounters happen, the close proximity of the massive structures set up powerful gravitational forces known as tides. As the galaxies move closer the enormous attractive forces act to dramatically and often violently alter the structures of both participants. The 51st entry in Messier's list actually represents 2 galaxies. NGC 5194 (also known as M51A) represents the magnificent spiral, while NGC 5195 (also known as M51B) is likely an irregular type dwarf galaxy now located behind the larger spiral galaxy. There have been many attempts to explain the morphology and evolution of the NGC 5194/5195 system including its apparent tidal bridges and grand design spiral shape. 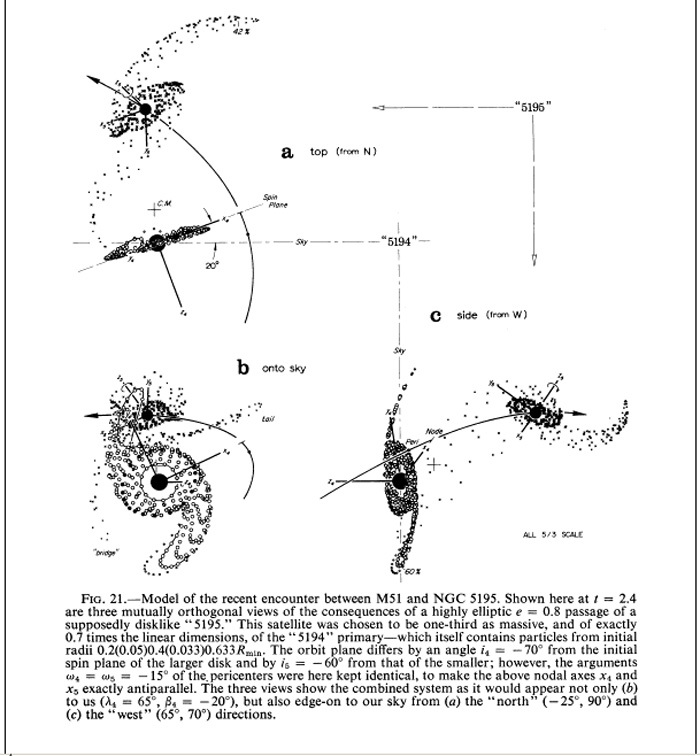 Classic papers by Toomre (1972), Howard (1990), and Rots (1990) have provided valuable insight into the evolution of the M51 complex and are summarized below. Simulations suggest that NGC 5195 is located well behind NGC 5194 and that the two galaxies are now traveling away from each other. The two galaxies had their closest recent approach some 70 million years ago, when the less massive NGC 5195 encountered the disk of NGC 5194 in a highly inclined passage. The effects of that interaction include several conspicuous disturbed features as well as a general brightening and strengthening of the inner spiral arms of NGC 5194. The disturbed features include the marked asymmetry of the spiral arms both near and far (north and south) in relation to the companion NGC 5195. The near arm appears thin and extended and the far arm fans out as an extended tidally disturbed structure. The extraordinary plumes that extend north, northwest, and southeast from the companion were likely torn from it as it engaged the more massive spiral in its recent encounter. The apparent spiral arm-bridge (northern arm) between the two galaxies is an illusion as NGC 5195 is far behind the NGC 5194, the near spiral arm being superimposed over the disk of NGC 5195 in the same line of sight. A visible area of intense star formation is conspicuous near the nucleus of NGC 5195 and was almost surely triggered from the time of the recent approach. Not all the disturbed features of the M51 complex are believed to be from the recent encounter. Radio surveys have detected an immense gas cloud with no optical counterpart that fans out along the eastern side of the M51 complex, extending some 300,000 light years in length and carrying about 500 million solar masses. It appears to be an extension of the optically apparent far spiral arm but is most likely an independent feature and a relic from a previous crossing that occurred as much as 400 million years ago. The 21 cm spectral line Radiowave data highlights neutral hydrogen revealing the true gaseous extent of the galaxy which includes the long tidal tail of neutral Hydrogen shaken loose by the interaction of these two galaxies over hundreds of millions of years. The ultimate fate of the M51 complex will likely be a gradual decay in the orbit of the companion (the orbital period now is about 500 million years with a major axis of about 50,000 light years) towards a final merger with the spiral and eventual tidal breakup of the companion in about 1 to 2 billion years.